The importance of clean, dry compressed air cannot be underestimated. 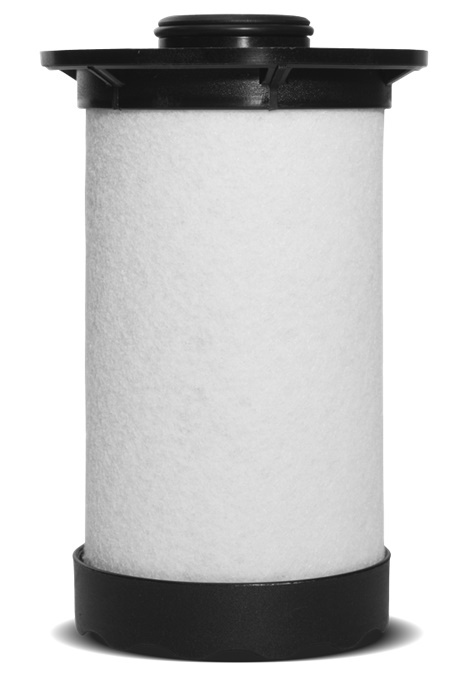 Filter out dirt, oil, and water with a top quality compressed air filter. These filters are used to prevent damage to your equipment or process from impurities such as water, oil and also scale from your piping. Too small of a filter or a dirty filter element can lead to increasing compressor pressure set point in order to keep the downstream pressure high enough. A 10 PSI increase in pressure is equal to a 5% increase in energy usage. Depending on the type of compressed air filters we can effectively remove up to 99.9% of these impurities. Compressed air filters are sized based on maximum CFM: Ranging from 18 CFM to 1000’s of CFM. 1 micron standard compressed air filter & water separator. Removes large liquid loads, all solid particles 1 micron or larger, oil aerosols. Use as a separator downstream of the aftercooler or point-of-use filter where heavy liquid loads are expected (air systems without aftercoolers or dryers). These filter elements are also for use prior to an air dryer to protect the internal piping and the drain in a refrigerated air dryer. 0.1 micron compressed air filter removes all liquid water,oil aerosols and all solid particles 0.1 micron or larger. 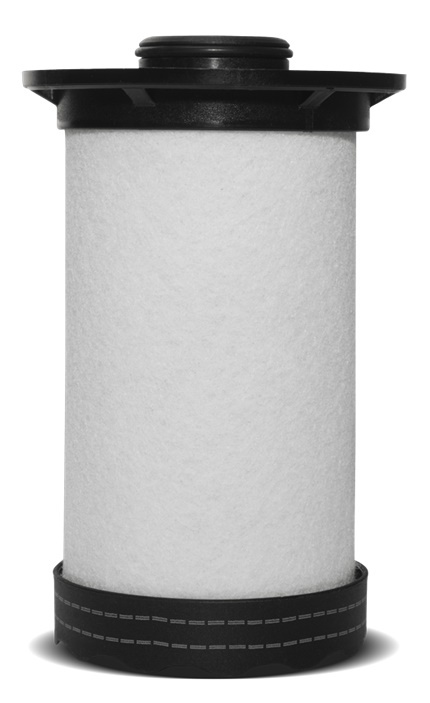 Use as a general filter for shop air; a prefilter for high efficiency filters. 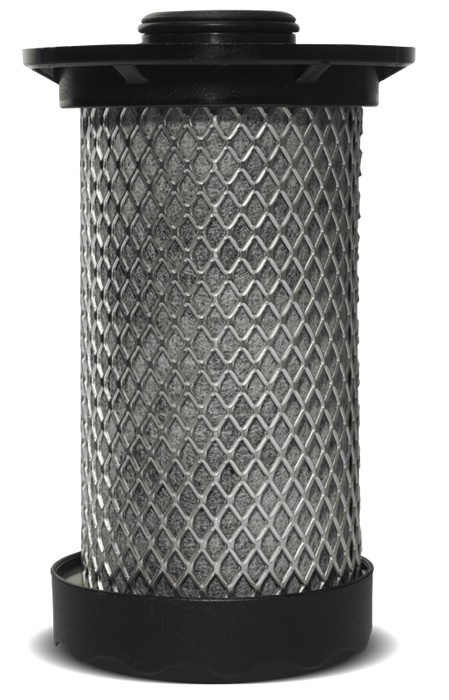 an afterfilter for pressureswing desiccant dryers; a point-of-use filter on systems utilizing aftercoolers or dryers. 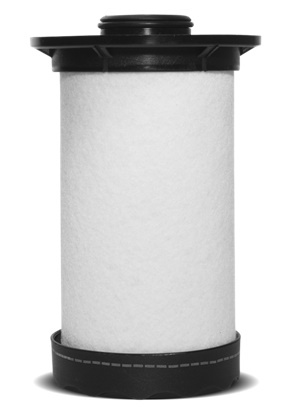 0.01 micron Coalescing filters coalesce and remove 99.99+% of oil aerosols for virtually oil free air. Use with oil-lubricated compressors to produce oil free air for painting (spray and powder), molding for plastics, instrumentation and controls, fluid logic and air bearings. 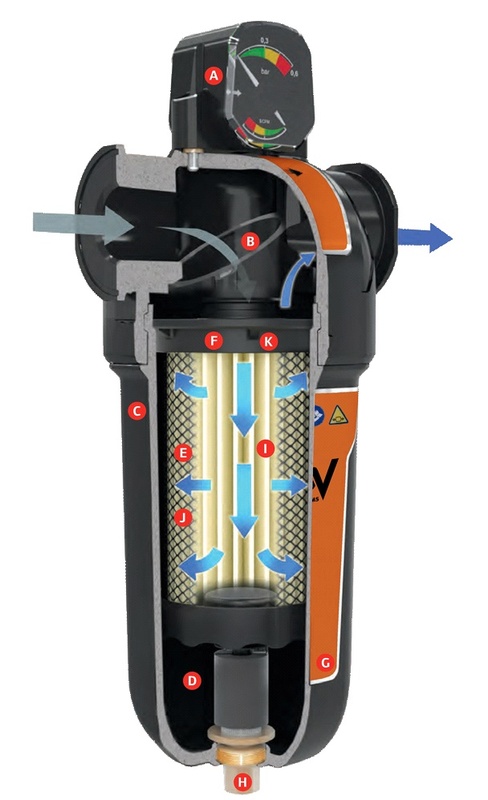 Activated carbon adsorbent compressed air filter removes oil vapor and odor. Use in food and drug packaging where compressed air contacts product, for deodorizing air exhausted into worker environments.